Jan 2017. The bike lanes are now complete with final linemarking installed in January 2017. The linemarking defines where people can park and where to expect cars and bike riders to be positioned on the road, improving safety for everyone. Feb 2016. Roadworks have started along Sandy Bay Road in preparation for a new on-road cycling lane stretching from Lower Sandy Bay shops to Taroona. This stage will include new kerb ramps, gutter renewal and installation of painted on-road bicycle lanes. Additional traffic islands to improve pedestrian safety will also be installed. The bike lanes should be finished by the middle of the year. Sept 2015. At the Council meeting on 7 September the next stage of the Sandy Bay Road bike lanes from Lower Sandy Bay to the Taroona Boundary were approved. The design also includes improved amenity for pedestrians with dedicated crossing points on Sandy Bay Road. Council had to balance the parking needs of residents while improving traffic flow for motor vehicles and bicycles. The new lanes will improve the comfort of riders while making it easier for drivers to pass bike riders. The diagram (right) shows the section of Sandy Bay Road at the intersection with Churchill Ave. Green lanes will be installed across the intersection and line marking will define the travel lane, bicycle lane and parking lanes. Linemarking is expected to commence over the summer period. June 2015. The City of Hobart will be starting consultation with frontage properties about the detailed design of the next stage of the Sandy Bay Cycleway project (from Wayne Avenue to the City’s southern boundary at Taroona) in mid June 2015. When the consultation material is distributed, more information will be available at the following link to Hobart City Council website. Oct 2014. Design work is underway for bike lanes on Sandy Bay Road between Cartwright Reserve on the Taroona boundary to Lower Sandy Bay shops. Oct 2014. Footpath widening to shared path standards has been done. For riders not confident enough to continue their journey towards the city mixing with the traffic on Sandy Bay Road through the shops, the new shared path provides an alternative connection to/from Marieville Esplanade. A crossing point has been constructed at the end of the bike lanes near Derwent Water Ave to the shared path, although some riders may prefer to use the Nelson Road traffic lights to access the path. This provides a connection to Battery Point and a preliminary link to the proposed Battery Point Walkway. Before and after photos showing the wider footpath and contrasting coloured driveways (to highlight potential conflict points) to provide for children or novice riders. Feb 2014. Most of the linemarking work has been done with bike lanes marked along Sandy Bay Road between Derwent Water Avenue near the casino and Fisher Ave in Lower Sandy Bay. Green coloured treatment has been used at intersections to highlight potential conflict points and pedestrian refuges will be formalised shortly. Jan 2014.Road repair work including concrete slab repairs, service cover adjustments, crack filling has been completed. The line marking contractor has commenced works and is expected to remove existing line marking and set out the new line marking by mid-January. New line marking and the bike lanes will start to be rolled out progressively over the length of Sandy Bay Road from mid-January. Nov 2013. Hobart City Council has advertised for tenders for the installation of painted bicycle lanes on Sandy Bay Road between the casino and Lower Sandy Bay shops. In preparation for the linemarking, work is being carried out to improve the surface including filling gaps and potholes, replacing metal manhole covers with non-slip ones, replacing drainage grates with cycle-friendly version. Final detailed design has been done and it is expected that the work will be carried out in early 2014. Hobart City Council will implement a communication strategy to explain the project to the community prior to commencement of works. June 2013. At the HCC meeting on 11 June 2013 Alderman Burnet tabled a petition containing 785 signatures in relation to the proposed separated bike lanes along Sandy Bay Road, between Marieville Esplanade and Long Point Road, Sandy Bay, identifying a preference for a cycleway fully separated from motor vehicles that will cater forall sorts of people riding bicycles, including children. The Aldermen voted in favour of the recommendation from the pervious Infrastructure Services meeting (10-2 votes) to proceed with detailed design for on-road bike lanes in Section 3 (not a separated cycleway) and approval to progress the design of sections 4 & 5 further south to the Taroona boundary. Generally there was a high level of support for the project except for some residents living along the route who provided feedback. The consultation found that Section 3 recorded a higher 'unsure' vote, reflecting the concerns surrounding this section raised through the consultation on perceived impacts on traffic management, parking, property access and the interaction between pedestrians, cyclists and motorists. At the HCC Infrastructure Services meeting held on 29 May 2013 the report examined two alternative proposals for Section 3 (widened footpath and on-road bicycle lanes) and recommended bike lanes as the preferred option, rather than a bi-directional cycleway. Bicycle lanes will improve conditions for existing riders but young or inexperienced riders will need to continue using the naoorw footpath and share with pedestrians and dogs. - retention of car parking in front of St Stephens Church and Sandy Bay Infant School which created potential conflict between people getting out of parked cars and cycleway users going past the shared zones on the footpath. The amended design has a number of flaws. It doesn't provide an adequate level of service to the majority of people currently riding Sandy Bay Road which will result in the majority not using the cycleway. The widened footpath design recreates all the limitations of footpath cycling (obstacles such as poles, conflict with people getting out of parked cars, pedestrians walking on the cycleway section as only a white line provides separation, poor sightlines at driveway crossovers) and reduces the remaining road space for the existing riders using the roadway. Apr 2012. At the Hobart City Council meeting held on 16 April 2012, Council unanimously agreed to approve, in-principle, the Sandy Bay Cycleway project with design and engineering work to be undertaken for all sections of the Sandy Bay Cycleway to the shovel-ready stage and seek sources of funding for the project. The design phase will provide opportunity for concerns raised in the consultation on some sections of the concept plan to be addressed. A full copy of the report summarising the Sandy Bay Rd consultation can be viewed under the Agenda for the Infrastructure Services Committee meeting held on 28 March 2012. Approximately 1500 people and organisations provided direct input to the project through feedback forms, submissions or letters. Six petitions with a combined total of approximately 2900 signatures were also received by Council. The statistics show there is clearly a high level of support for the project, except for some of those residents living along the route who provided feedback. For the Council a key issue will be how to alleviate the concerns of those residents living along the route and elsewhere in Sandy Bay with regard to the perceived impacts on traffic management, parking, property access and the interaction between pedestrians, cyclists and motorists. - Total level of support for the project was 71% (an average of 638 respondents) for all road sections. - The section with the lowest level of support is Section 3a/3b (St Stephens Church and Sandy Bay Infant School) with 65% (563 respondents). This section recorded a higher 'unsure' vote, reflecting the concerns surrounding these zones raised through the consultation. - For residents identified as living along the proposed route, opposition outweighs support with 66% opposed (60 respondents). - For other residents of Sandy Bay, the level of support is marginally above that of oposition for all sections except for Section 3a/3b, again reflecting the concerns of those zones. - For people living in other Hobart suburbs, the level of support far exceeds that of opposition with an average of 240 respondents registering support compared to only 14 in opposition per section. - For people from other municipalities, interstate or no recorded address, the level of support is also very high with an average of 271 respondents in support comparted to 35 in opposition per section. The consultation found the section with the most support was the Taroona boundary to Lower Sandy Bay so it would seem sensible that HCC tackle that section first and leave the more complex and controversial middle section for later. June 2011. A report is being prepared on the public consultation feedback and is likely to be presented to the Aldermen later in the year. Over 1000 submissions were received by Hobart City Council on the proposal for improving Sandy Bay Rd for walking and cycling. This has resulted in a lengthy process to analyse the feedback and prepare a report for Council. Mar 2011. Hobart City Council was presented with a petition of over 2000 signatures in support of the proposed cycle/walkway along Sandy Bay Rd in February. Deputy Lord Mayor, Alderman Helen Burnet, who presented the petition at the Council meeting said the number of petitioners offering their support for the cycle way was a clear sign of overwhelming support, and in contrast to petitions tabled in September 2010 asking for retention of parking. The petition received stated that the undersigned ‘Support the current consultation process in regard to the Sandy Bay Walking and Cycling Project and the proposed designs for the cycle facilities and road infrastructure changes ‘. Alderman Burnet said: “It is very encouraging to see the widespread public support for the concept of a cycleway along Sandy Bay Rd. Signatories are from Sandy Bay to other areas of our city and beyond. The very strong show of public support for improved cycle infrastructure along Sandy Bay Rd should be a clear message to all that there is widespread support for the current proposal and the extensive consultation already undertaken. Utmost in my mind is the safety of people riding to and from work, for recreation and we know full well that the current situation can and should be improved." Over 250 riders showed their support for the proposed bike lanes by joining a group ride along Sandy Bay Rd. To view photos visit Healthy Transport Hobart website. Over 2000 signatures have been collected in a petition in support of the Sandy Bay Rd cycleway and will be submitted to Hobart City Council on 15 February 2011. Bicycle Tasmania has been collecting hundreds of signatures on a petition to go to Hobart Council to support the current public consultation process in regard to the Sandy Bay Walking and Cycling Project and the proposed designs for the cycle facilities and road infrastructure changes. You can sign it at your local bike shop or download a copy from the Bicycle Tasmania website and get your friends, family and work colleagues to sign it. In October 2010 Hobart City Council voted to review it's approach to carrying out community consultation on cycleways by inviting Harry Barber, CEO of Bicycle Victoria and Jonathan Daly from GHD to run a workshop on how to better introduce such changes. For more see The Mercury website. Click here to view similar bike lanes used in Paris, Montreal and Sydney. To follow the progress of community reaction to these plans see Healthy Transport Hobart website. July 2010. Hobart City Council has developed a detailed concept plan for the route following the wide-ranging public consultation during 2008-2009 which found broad support for improved facilities for walking and cycling along the Sandy Bay Rd alignment. The proposal includes a protected 2-way bike lane along the water side of Sandy Bay Rd with a separate footpath alongside for pedestrians. Families and other people who want to ride their bikes but find riding on Sandy Bay Rd with traffic intimidating will have a comfortable and traffic-free place to cycle between the park at Longbeach and the Marieville Esplanade park. - Improved traffic flow by providing designated turn lanes and roundabouts at intersections. - Improved amenity for people walking on the footpath who won’t have to share with people cycling on footpath any more. - improved crossing of Sandy Bay Rd for pedestrians through installation of pedestrian refuges and reduced crossing distance. The design includes separated footpaths from the cycleway (in most cases), better crossing points, upgrade of the "scenic esplanade" section from the Casino to Maning Ave and improvements to bus stops. We have requested that the two shared zones shown outside Lipscombe Ave and Sandy Bay Infant School be changed to a deliniated footpath and cycleway. The proposed design would see some loss of parking along the water side of the road but the installation of roundabouts will provide turning opportunities for vehicles accesing available parking on the other side of the road. Two of the outbound bus stops will require buses to stop in the middle of the road to let passengers off (creating a delay of up to 10 seconds) but this will be offset by the installation of designated turning lanes which will reduce the incidence of drivers blocking the lane while waiting to turn right into sidestreets. Public displays will be held at the Hobart Council Centre at 16 Elizabeth St from 23-July to 27 August. For more information or to provide feedback or show support for the project see Hobart City Council website for more. Nov 08. 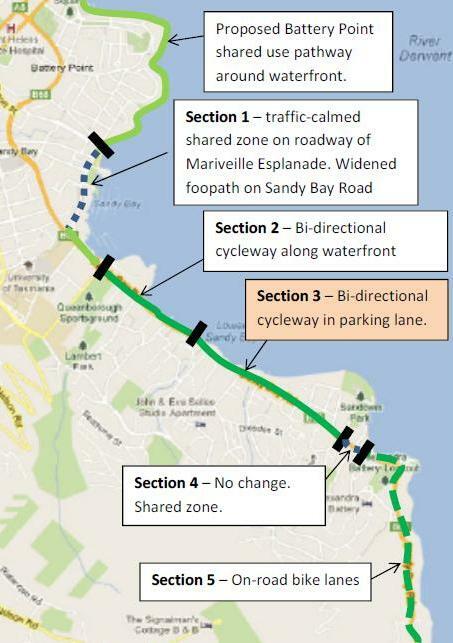 Hobart City Council is proposing improved walking and cycling facilities from Marieville Esplanade to the City’s southern boundary with Taroona along Sandy Bay Road. Your input and support is required. Further information about the concept and a feedback form can be downloaded at Hobart Council website. Opportunities for public comment and feedback about the project are available from the public display at the Hobart Council Service Centre until Friday 14th November 2008. The Consultation will conclude in late November. June 07. Council has called for Expressions of Interest to carry out stakeholder and community consultation in relation to options for improving cycling and pedestrian facilities from the City to the Southern Boundary. This is an important first step in moving this process forward. Part of the corridor that will be examined as part of this process is Sandy Bay Road, an imporant cycling route into Hobart from the south of the city.